The IF4K-DNC is a 12G-SDI compatible, cost-effective processor, equipped with a 4K (UHD) to HD down converter that provides simultaneous 12G and HD output. The unit also handles frame synchronization, color correction, HLG to SDR conversion, and supports wide color gamut as well as 12G and HD output. 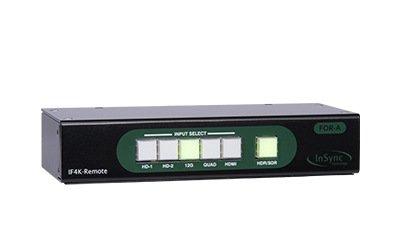 The IF4K-DNC supports AES and analog audio output and is ideal for audio monitoring. HDR (HLG)/SDR conversion and wide color gamut (ITU-R BT.2020/709) conversion support. Enables simultaneous output of 12G-SDI HLG/ITU-R BT.2020 and HD-SDI SDR/ITU-R BT.709.